Stephen is the author of books detailing how quantum principles underlie the events of everyday life, both in the minutia of our personal experiences, and in the experiences and behaviours of tribes, communities, nations. Simple Tools: for Clarity, Understading and Betterment. 6. 3 .. 2 .. 1 .. Reviews for Simple Tools via Belief Institute.com, Amazon and Google. The term holo-dynamic system is (in my opinion) a more descriptive understanding of "holomovement" — a term coined by the late physicist, David Bohm. Bohm used the term holomovement to more accurately describe the inherent holographic nature of reality. Read more about What does 'holodynamic system' mean? Your belief-system is what causes you to think and feel the way you do. Your belief-system will determine whether you're depressed, happy, sad, excited, or bored. Your belief-system determines your courage, fears and behaviours. You only need to examine your life to see your belief-system at work, as reflected in your level of success, your health, wellbeing and the quality of your relationships. 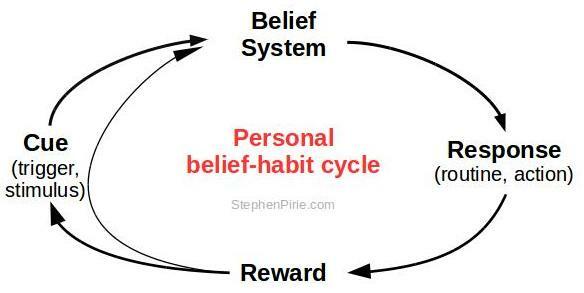 Your belief-system is your "auto-pilot" — the beliefs you hold and the "facts" you automatically take for granted. Your auto-pilot makes you do what you do, and is the root source of all the wonderful things in your life: the loves, the fun, the money and the pleasant surprises, as well as all the drama, conflict, frustration, stress and other negative situations. "Between stimulus and response there is a space. In that space is our power to choose our response." Read more about What is a belief-system? By coincidence I've only recently (namely, this morning) come across a 1991 paper by Prof. Robert Jahn of Princeton's famous1 PEAR laboratory. When posed in polar opposition, whether within a single personality, or in the context of the ubiquitous interactions between the male and the female sexes, the failures of this interface are legion, legendary, and immensely destructive, both personally and socially. Yet, when deployed in constructive complementarity, the masculine/feminine integration within the individual can enable the highest creativity and personal satisfaction, and in the male/female partnership can generate some of the highest accomplishments, profoundest insights, and most beautiful resonances of human existence. In this form, it is probably the species' most powerful resource for spiritual as well as physical survival and evolution. Why I concur with Jahn is that the deeper nature of what 'feminine' and 'masculine' actually mean is not widely understood or appreciated. 2. I used to think that I was well ahead of other thinkers on the subject of the deep frameworks of life, but Jahn has demonstrated he largely got there first! I suppose my contribution is the comprehensiveness of my work, going well beyond that of Jahn's paper. Still, I freely give recognition when it is appropriate and deserved.